Working in partnership with Pi Studios in London we are proud hosts of the Classical Matwork and Full Comprehensive Apprenticeships. The training days will be held at Pi Studios in London with the apprenticeship and test outs taking place at The Pilates Pod in Hitchin. The Matwork training programme is designed to take you through the full Classical matwork order that Joseph Pilates created. You will learn to teach it with an organised flow and rhythm designed to give a full body workout. Completing all three programmes will leave you confident and capable to teach group classes safely and comprehensively with years worth of training for you and your clients. Your success lies in the repertoire itself and teaching it as a whole. We will teach you the very skills necessary to keep a class moving, and with the guaranteed Pilates results of improved mind and body that everyone is seeking today. The Pi apparatus training is a fully Comprehensive Training Programme. It is an in-depth study of all of the classical material as developed by Joseph Pilates. Through a series of five modules you will explore all the exercises on all the apparatus. The Pi approach is classical and 360 in approach. Learn how to integrate, navigate and challenge your client effectively at every level. 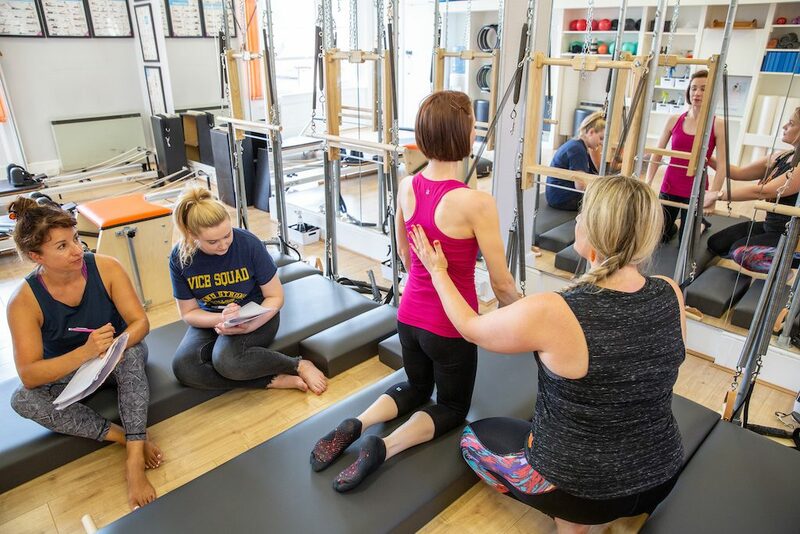 By the final module you will be able to teach a private or group class all the way through from the client’s first session up to any level, and be skilled to handle injury and chronic weakness and multi level teaching. 450-600 hours apprenticeship to include a mix of observation, self practice and teaching. Complete and pass the written and practical evaluations at 100 hours, 300 hours, 400 hours and final exam at the end of the apprenticeship usually 600 hours.